Mathematical induction is a method of mathematical proof typically used to establish a given statement for all natural numbers. It is done in two steps. The first step, known as the base case, is to prove the given statement for the first natural number. The second step, known as the inductive step, is to prove that the given statement for any one natural number implies the given statement for the next natural number. From these two steps, mathematical induction is the rule from which we infer that the given statement is established for all natural numbers. The basis (base case): prove that the statement holds for the first natural number . Usually, or . The inductive step: prove that, if the statement holds for some natural number , then the statement holds for . The hypothesis in the inductive step that the statement holds for some is called the induction hypothesis (or inductive hypothesis). To perform the inductive step, one assumes the induction hypothesis and then uses this assumption to prove the statement for . The first domino falls right. If a (fixed but arbitrary) domino falls right, then its next neighbor also falls right. With these assumptions one can conclude (using mathematical induction) that all of the dominoes will fall right. Mathematical induction… works because is used to represent an arbitrary natural number. Then, using the inductive hypothesis, i.e. that is true, show is also true. This allows us to “carry” the fact that is true to the fact that is also true, and carry to , etc., thus proving holds for every natural number . Calculating a series (examples below). Statements concerning divisibility (for example, proving that is always a factor of ). Here’s a common first (or maybe second) example of mathematical induction applied to an arithmetic series. : The left-hand is simply , while the right-hand side is , which is also equal to . So the base case works. : Assume that the statement holds true for the integer . I find it helpful to describe this to students as my target. In other words, as I manipulate the left-hand side, my ultimate goal is to end up with this target. Once I have done that, then I have completed the proof. Notice that we’ve seen almost all of this before, except for the extra term . So we will substitute using the induction hypothesis, carrying the extra along for the ride. Now our task is, by hook or by crook, using whatever algebraic tricks we can think of to convert this last expression into the target. Most students are completely comfortable doing this, although they typically multiply out the term unnecessarily. Indeed, many early proofs by induction are simplified by factoring out terms whenever possible — in the example below, is factored on the third step — as opposed to multiplying them out. In my experience, proofs by induction often serve as a stringent test of students’ algebra skills as opposed to their skills in abstract reasoning. A fair amount of algebra was needed to prove the case. However, the first step — the base case — was especially easy. Indeed, in most proofs by induction seen by students, the base case is often quite trivial… to the point that students often wonder why the base case is needed in the first place. : Let’s just ignore the base case, it’s unimportant. Now our task is, by hook or by crook, using whatever algebraic tricks we can think of to convert this last expression into the target. Clearly, something went wrong with the above proof. What went wrong, obviously, is that we didn’t check the base case. If , then the left-hand side is . However, the right-hand side is . So the base case is false. We correctly showed that, if the case is true, then the case is also true. The catch, of course, is that the case is never true. Using the domino analogy, we showed that if a domino falls, then the next domino will fall. But the first domino never falls. All this to say… yes, it’s important to check that the base case actually works. This student submission comes from my former student Angel Pacheco. His topic, from Precalculus: computing trigonometric functions using a unit circle. The first course to bring in the unit circle is Pre-Calculus. It is used in a lot in calculus when it comes to finding certain values of trigonometric functions. Knowing how the unit circle works, it allows the students to solve a lot of trigonometric functions on their own. Once students reach college level mathematics, they will learn that the unit circle is a key element to trigonometry. Trigonometry is a huge part of all the calculus courses. Science contains a lot of trigonometry, mainly physics. The law of sine and cosine allows the students to determine the angle an object is or even how far it is. Being able to use the unit circle to solve for functions, it allows them to use it any subject whether it be a science or a math class. Students or scientists that know how to solve trigonometric functions using the unit circle allows them to compute certain things on paper as opposed to relying on a calculator to do all the work. Technology can be used to introduce and also evaluate their content. There are different ways to use technology. One example is using Khan Academy videos to show students how it works or how Khan explains. Students having to look at a video can have them engage on the topic. My personal favorite is to create an exciting video and put it on YouTube. I have noticed that parodies are a popular trend so creating a parody with the unit circle with a popular song will be effective to engaging the students to this topic. The next thing I would use for technology is graphing calculators. I think if the students see that the calculator gives them the same answer as the values they learned from the unit circle, they would be amazed on how the concept of the unit circle is. My classmates and I were in complete shock when we realized how the unit circle worked. My former teacher also had a clock based off of the unit circle so we had to learn it in order to read the time. The link below shows a sample lesson that allows the students work in groups to solve trigonometric functions and create a table that shows the solution to certain problems. The students will have a calculator with them that can be used for checking their answers to see if they are on the right track with the assignment. Also, having access to the computers to research particular things that they need for explaining will be acceptable. In my opinion, I feel that there is some tweaking that I recommend making it more effective. I would like to have a website that visually shows the unit circle. If possible, I would like for the students to have a worksheet that allows them to know which steps to follow to ensure that they are on the right track. A great form of assessment will be a quiz following this activity. I feel asking them to draw the unit circle and also solve certain trigonometric functions to see if they understand it. I would also like to like to bring in all six of the functions and show the relation with the unit circle. The report then goes on to describe how advanced mathematics courses that emphasize theorems and proofs, such as abstract algebra, real analysis, group theory, and number theory, are directly relevant for teaching the secondary mathematics curriculum. In my experience, most math majors who want to be high school math teachers understand why they have to take calculus, statistics, linear algebra, and math courses specifically designed for their future career. But a perennial question that they often ask is, “Why do I have to take theorem-proof math classes if all I want to do is teach high school math?” Some years ago, I wrote the following document for my students to address this issue, which hopefully provide some good reasons for why these more abstract courses are required. 2. Theorem-proof courses are specified by the National Council of Teachers of Mathematics (NCTM) and the National Council for Accreditation of Teacher Education (NCATE) as part of the national standard of best practices for preparing future high school math teachers. Furthermore, you will be responsible for the material in these classes when it’s time for you to take the TExES certification exam. All this to say, including these classes in the curriculum isn’t a requirement that somebody at our university thought was a bright idea; this is an “industry standard,” so to speak, for the preparation of highly qualified secondary math teachers. 3. Of course, simply saying “You have to do this because the ‘powers that be’ say that it’s good for you” may not be a terribly motivating reason for you to be in courses that emphasize mathematical abstraction. Another good reason to take these courses is because it’s always a good idea for teachers to be familiar with a few years’ worth of mathematics above the subject matter that they’re teaching. Right now, you probably expect (perhaps subconsciously) that your professor knows not only the content immediately pertinent to your class but also the content in subsequent classes, so that you’re prepared to take those subsequent classes if you elect to do so. The same logic will apply to you when you become a teacher yourself. Ideally, elementary school teachers should teach their classes mindful of the fact that elementary school arithmetic is not a mere exercise in computation but part of a process of logical thinking that will be further developed in middle-school algebra. In the same way, when you become a secondary math teacher, you should be familiar with the topics that lie beyond algebra, geometry, trigonometry, and calculus. High school teachers (and, if they’re honest, college professors) will tell you that it’s quite embarrassing to be unable to provide an immediate answer to a student’s question, no matter how difficult. It’s even worse if the teacher is at a complete and utter loss as to who or what to consult to provide the answer. Theorem-proof classes will hopefully provide you the framework to answer such questions. Unions and intersections of sets are important for developing the rules for computing , the probability that event happens or event happens, and , the chance that and both happen. Important examples of equivalence classes are those derived from congruences, a notion which leads to the familiar grade-school rules for testing for divisibility by , , , , , , , or . The notion of an injective function explains why the horizontal line test works. The axioms of ordered fields are the logical framework behind high school algebra, and for why the “FOIL” method is correct but the “distributive” property is incorrect. The density of both rational and irrational numbers is often taken for granted by high school students without explanation. The order of quantifiers is important for distinguishing between the continuous functions and uniformly continuous functions. The latter notion is necessary to formally prove that every continuous function has a definite integral on a closed interval, often taken for granted in Calculus I. The notion of supremum and the completeness property of underlie some important concepts in calculus, including the proof of the intermediate value theorem, the rigorous definition of a definite integral, and the proof that the definite integral of the sum of two functions equals the sum of the two definite integrals. Many optimization problems in calculus rely on the fact that continuous functions assume both an absolute minimum and absolute maximum value on any closed interval. The proof of this theorem relies on properties of closed sets and compact sets. The proof that the composition of two continuous functions is continuous (and also the proof of the Chain Rule for differentiation) relies on properties of open sets. Limit theorems that are often taken for granted in calculus may be proven using limit theorems about sequences. The Mean Value Theorem (from Calculus I) is derived from the fact that limits preserve inequalities. Many important properties of calculus, including L’Hopital’s Rule, indefinite integration, curve sketching, and Taylor series, are direct consequences of the Mean Value Theorem. The Root and Ratio Tests from Calculus II are derived using the notions of limsup and liminf. Hopefully, while you’re still in college, you will begin the process of making connections between the topics that you will directly teach your students and the topics that your students will see after they graduate from high school. This may not fully sink in until you begin student teaching; only then will you realize the importance of being able to prove something (i.e. teaching a topic in a logical manner) when you are trying to explain it to inquiring minds. As a student taking real analysis or abstract algebra, it’s easy to lose sight of the forest for all of the trees. That is, it’s easy to simply develop your skills in abstraction and theorem-proving without realizing that the topics you’re learning are indeed relevant to your future career as a mathematics educator. Teach North Texas and the UNT Math Department both wish you well as you continue through our degree program. I recently came the following article concerning the mathematical jokes that can be found in various episodes of the Simpsons: http://www.theguardian.com/tv-and-radio/2013/sep/22/the-simpsons-secret-formula-maths-simon-singh. For a more detailed listing of mathematical references, I highly recommend http://www.simpsonsmath.com (or http://mathsci2.appstate.edu/~sjg/simpsonsmath/), maintained by Dr. Sarah J. Greenwald of Appalachian State University and Dr. Andrew Nestler of Santa Monica College. I’ve used the “r dr r” joke in my calculus class many times, and each time it was a hit. My colleague Jason Ermer has posted his 7th challenge video, shown below. It’s both an experiment and an exercise in probability. Video responses can be posted to his website, http://www.collaborativemathematics.org. In the words of his website, this is a unique forum for connecting a worldwide community of mathematical problem-solvers, and I think these unorthodox but simply stated problems are a fun way for engaging students with the mathematical curriculum. This student submission comes from my former student Angel Pacheco. His topic, from Geometry: finding the volume and surface area of pyramids and cones. Show an example of the pyramid of Giza, give them dimensions of the pyramid as well as the dimensions of the blocks that were used to build it and have the students guess how many blocks it took to build it. The students can use this as a competitive edge to want to get the correct answer. Students will have to solve for the surface area of the pyramid and the area of the face of the block. There can also be an example where I will tell the students if the pyramid was fill of blocks and they’re given the dimensions of the pyramid and block. They then find the volume of both to determine how many blocks can fill in the pyramid. 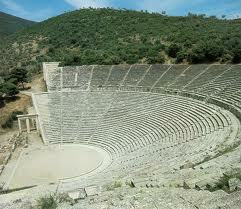 I will then show an image of a Greek amphitheater and explain how it resembles a cone. I will give them dimensions of a Greek amphitheater and have them find the surface area and the volume of cone if the amphitheater was folded into a cylinder. Students will be reintroduce to the volume of a cone in multivariable calculus when they learn about triple integrals and the different forms of integrals, like Cartesian, Polar, and Spherical coordinates. Surface Area and Volume of both the shapes will be seen in architectural engineering whenever they come across an assignment or job that requires them to find how big the cone or pyramid is in their draft of a monument or building. This topic can also assist the students in their Geometry class in high school as well as college level. In mathematics, it’s better if there is a stronger foundation build in the early ages. When students face volume and surface area of pyramids and cones, they will gain more knowledge of the concept as time progresses. It’s always good to start early. Talking to students about different shapes and their areas and volumes gives them perspective in geometry. In Ancient Greece, there were famous scientists that contained vast amount of knowledge. For example, Thales of Miletus and Democritus were some of the scientists that used surface area and volumes of cones and pyramids. Democritus was one of the first to observe that cones and square pyramids were one third of the volume of a cylinder and prism, respectively if they have similar measurements. I would use this as an engagement because Greek mythology is pretty popular. This could be used to show students that the math they are doing today is similar to the math that was done in the past, ancient past. 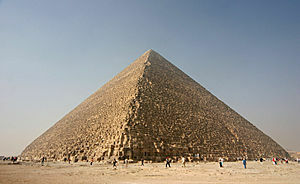 In Ancient Egypt, square pyramids were used to create the famous pyramids of Egypt such as the Pyramid of Giza. Pyramids were used to idolize their kings. The Mayan Indians also used pyramids to idolize their leaders. Bringing up different examples of different cultures that talk about the shapes they see in class then it can grab their attention. The link below is a lesson that talks about surface area and volume of cones and pyramids. It seems as an effective tool to assess students if they understand the concepts of SA and Volume. This student submission comes from my former student Roderick Motes. His topic, from Geometry: distinguishing between axioms, postulates, theorems, and corollaries. This topic lends itself well to projects, and to activities. Axiom systems are fundamental to the study of math. In high school geometry in particular we start to ask students to do proofs. When students begins proofs it’s important that we define what we’re working with. All students know definitions, these tell us what the objects ARE. Postulates and Axioms tell us the most basic rules of how an object behaves. This is an example of an axiom. With careful choice of activity you can distinguish between theorem and corollary. In geometry in particular we can use the theorem that opposite angles are congruent to quickly prove that the sum of the angles when a line cuts another is 4 right angles. This is a quick corollary, and so the difference between corollary and theorem could be shown AS PART OF an activity you already have. So there are really two places that you can fit this. Adapting an explore will allow you to quickly demonstrate the difference between theorem and corollary. Having students prove solutions from axioms is another method of showing everything. Below I have included several axiom systems you could fit in. Euclids Elements defines Euclidean Geometry, and so whenever you are proving something from there you could consider adapting your activity to require proof from axioms and prior proofs. The axiomatic method took us a while to work the kinks out of and, accordingly, it’s history is rife with interesting figures. We can start at the beginnings with Euclid though, to be fair to those before him, his work built upon the works of the Pythagoreans, Plato, and Theaetetus (the first two of which have countless fun asides you can discuss.) Euclid wrote down his ‘postulates and common notions’ and proceeded to build up Euclidean Geometry from them. Euclid is a rather mysterious figure for all we know about him. He is alleged to have published many books. Interestingly he is thought to have published the book “Music: Elements of Music” in which he extends on the Pythagoreans musings on the connection between intervals in music, and mathematics. After the Greeks the seat of mathematical progress moved to the Middle East. During this time many mathematicians would continue to use the axiomatic method of Euclid, but none doubted his own axioms save for a few. Among these men was one Omar Al-Khayyam. Al-Khayyam raised some objections to Euclids use of the 5th postulate (the parallel postulate.) This same objection would later be noted and used as the basis for the study of non-euclidean geometries. Outside of mathematics Al-Khayyam was an interesting man. He was a poet as well as a mathematician, philosopher, and astronomer. Quite interesting he was brazen enough to publish the idea that the year was actually 365.24219858156 days. I say it was a brazen idea because the degree to which he was claiming accuracy was more or less unheard of for astronomical calculations at the time. What’s amazing is how right he was. His calculation is accurate to the sixth decimal place which, we now know, actually varies naturally. It would be like someone coming into a room and telling you that you are 5.62536412 feet tall based on their calculations and then having them be correct. Cantor is particularly interesting, I think, since his mathematics earned him such admonition as a “scientific charlatan”, a “renegade” and a “corrupter of youth.” It wasn’t until the tail end of his life, having been driven to fits of madness and depression, that he finally started to be realized as one of the great mathematicians, and his set theory to be one of mathematics crowning achievements. Axiomatic methods can be used to prove everything is true (well… mostly. Incompleteness Theorem throws a wrench into the works but is well beyond the scope of a high school course.) Have the students ever wondered why we factorize things into primes? Or wondered how any of the mechanical routines they’ve learned (like synthetic division) can be justified or proven? If so, then they’ve been looking for the same kind of path that we’ve taken all throughout Math 4050. We take some simple basic principles about numbers, and show that they have complex consequences. Moreover we show that we can extend these principles to many different areas. In geometry in particular we can give geometric, visual, intuitive ideas some very rigorous backing. Moreover much of Euclids Elements gives us an intuition for algebra without explicitly using it. Consider when Euclid proves Pythagorean Theorem. Nowadays we say a2 + b2 = c2 . But Euclid actually proves it by showing that the area of a square with side A, plus the area of a square with side B sum to the area of a square with sides C. He takes the literal square of the sides, and shows they are equal. This is a very interesting way you could discuss these points, and connect back with your students. It’s an unfortunate fact of history that numbers of the form are called complex numbers. In modern English, of course, the word complex is usually associated with phrases like difficult, inscrutable, time-consuming, hard to solve, and other negative connotations that teachers would prefer to not introduce into a math class. However, my understanding is that the other meaning of the word complex was in mind when the term complex numbers was coined. After all, in modern English, we still refer to a group of buildings as an apartment complex or maybe an office complex. In this sense, complex means two (or more) things that are joined together to form a single unit, which is precisely what happens as the real part and the imaginary part $bi$ are joined to form . Indeed, my understanding is that complex was chosen to be the opposite of simplex, or a single unit (like a real number). Anyway, hopefully this bit of history can make complex numbers less mystifying for students. While I’m on the topic, the word imaginary was another unfortunate choice of words by our ancestors, but — like complex — we’re just stuck with it.